It was just as well we did the little bit extra yesterday rather than finishing at Porlock Weir in line with standard route, as we had to be in Minehead to meet our luggage and catch the bus to Taunton. All the other days we have dawdled, but we managed a respectable speed of 2.2 miles per hour today. There was a gentle start from picture perfect Porlock across the flood plain, via Bossington, which also looks like it fell off a chocolate box – all thatched cottages and roses rambling. We then turned into woodland at the foot of the hill, followed by a long, steady pull upwards for at least a mile. Once on the top, we had a choice between the ‘rugged’ path, which went up and down the combes, closer to the water’s edge, or the cliff-top path, with the view. We elected the top path – partly because it would be quicker, and partly because we had plenty of woodland yesterday, and wanted the views. In fact, there was not a lot to see, as rain set in around 9.45. It was not heavy, but it was persistent and the sea and sky blended into grey. Wales, which we have been able to see for several days, disappeared from view. There were a few Exmoor ponies chomping quietly and quite a few cows. Only heifers though, so no bother with them. The final 2 miles wound down through woodland again and we arrived promptly at 12.15. We had a quick bite in The Old Ship Aground, which had very kindly agreed to take our luggage in, then a whistle stop photo opportunity at the end of the South West Coast Path before a 10 min wait in pouring rain for the bus. Now on the fast train to Paddington. Today is my birthday, and I am able to celebrate it with a truly great present – finally completing the South West Coast Walk – 630 miles from Poole. But still only a fraction of my whole scheme! We covered 7.4 miles. We had an absolutely superb meal last night, and managed to be in bed by 10.30. It rained heavily during the night, but by breakfast time it was beginning to clear. We walked along the sea front at Lynmouth then climbed up through woodland to the cliff top. We passed a small church at Countisbury and, since both of us like old churches, decided to go in. Saxon in origin, the church is very plain, and now at quite a distance from any village. The hymn numbers from yesterday were still on the board. We checked the first, and, astonishingly, it was the hymn I think of as my own – ‘Eternal Father, Strong to save’ sung to the tune named Melita. Of all the possible hymns that it might have been, it was that. I am sure it was a sign – although for the life of me, I am not sure exactly what of. Rachel, who is a talented singer in one of the big London amateur choirs, began to sing, much to the delight of some German walkers who wandered in. Rather less dignified for Rachel was the failure of her trouser zip. I have been forbidden from adding any photographs illustrating the mishap. Shortly after, we took a short cut – the kind of short cut that ends in long delays. The Germans were following us, and we compared notes, agreeing that the map suggested a path outside a field edge would bring us back to the main route. We ended up in a thicket of bracken, so dense that we had to give up and retrace our steps to the point where we had left the main path. It must have added at least a mile to the whole day. The route then dropped down onto a valley, before joining a road a road, then into a long stretch of woodland, the flies were dreadful, crawling all over us, in our faces and hair, and driving us completely potty. We had to tolerate this through several miles of woodland, not compensated for by its general prettiness, lined with foxgloves. We were amused to see a mower of some sort that looked as though it had just been abandoned in the middle of the bracken – the driver was probably driven mad by the flies. There is a choice of routes here, and we elected to take the upper one along the cliff top. Longer, but easier and slightly more direct, with the aim of avoiding the flies. After several uneventful miles we dropped down again into woodland, and then we entered Alice in Wonderland territory – there were numerous signs for Porlock, but they pointed in different directions – we would follow one, then come to another pointing back in the direction we had come. No matter how far we walked, the signs continued to say 1.5 miles. Coombe Martin is an interesting little town – apparently, it has the longest high street in Britain, extending two miles up the valley. Originally a Saxon port, the Norman church of St Peter ad Vincula has a tower ninety-nine feet high. Sadly, the public conveniences were equally mediaeval. It was a cracking day. Superb weather again – warm, and absolutely still, although more humid than is ideal. The morning began with a long steady pull up to little Hangman’s head, followed by an even longer, but steady, climb to Great Hangman’s head. Apparently, this is the highest point on the whole coast path, although I must say it did not seem as high as some of the Cornish cliffs, or even as Golden Crest on the Dorset coast. Still, I suppose the people who carefully (do I mean obsessively?) measure these things, must know. The views were superb, the rocky cliffs behind and in front of us with Lundy falling behind, and the coast of South Wales looking clearer than yesterday. I guessed what we could see was the Gower Peninsula and the Mumbles. There was also a massive factory with a plume of steam emerging – presumably the steelworks at Porth Talbot. The day was uneventful – perhaps one to be remembered as a typical day on the coast. Even the cows were on the other side of the fence – atlthough they could not resist coming over to stare at me. 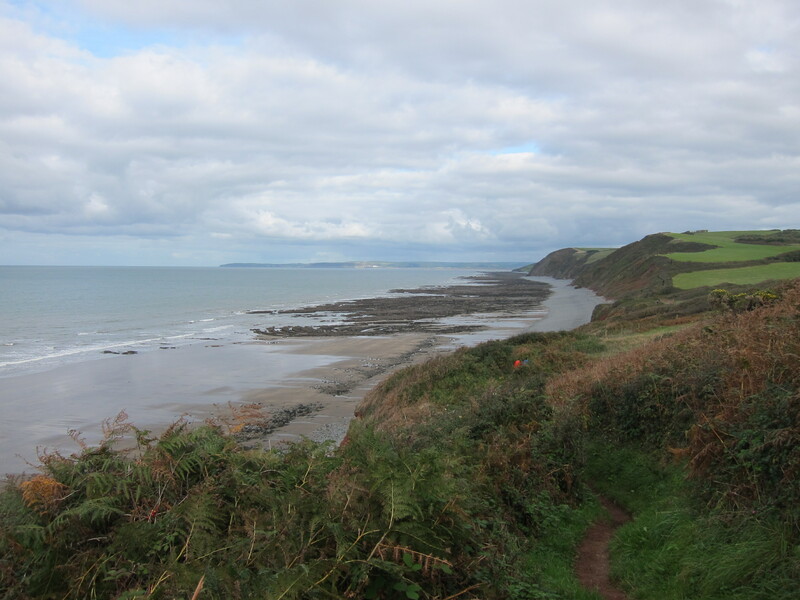 We are now on the north edge of Exmoor – Lorna Doone country. I must re-read the book. The steepest drop of the day was down to the river Heddon, on a narrow track which winds through low woodland, and is invisible from the other side of the valley. Located on the riverbank is the only refreshment point on today’s route, but as it was a half-mile extra in each direction, we decided not to make the detour. Instead, we took off our boots and soothed our hot feet in the bone-achingly cold river. There was then a long steady climb up the other side of the valley. The rest of the day, the path meandered on the tops of the cliffs, or along the sides, through a mixture of moorland, woodland and heath. We passed Lee Abbey, then, not far from Lynmouth, walked through some strange formations called Castle Rock, which were rather atmospheric, surrounded by the cloud that rolled in during the late afternoon. 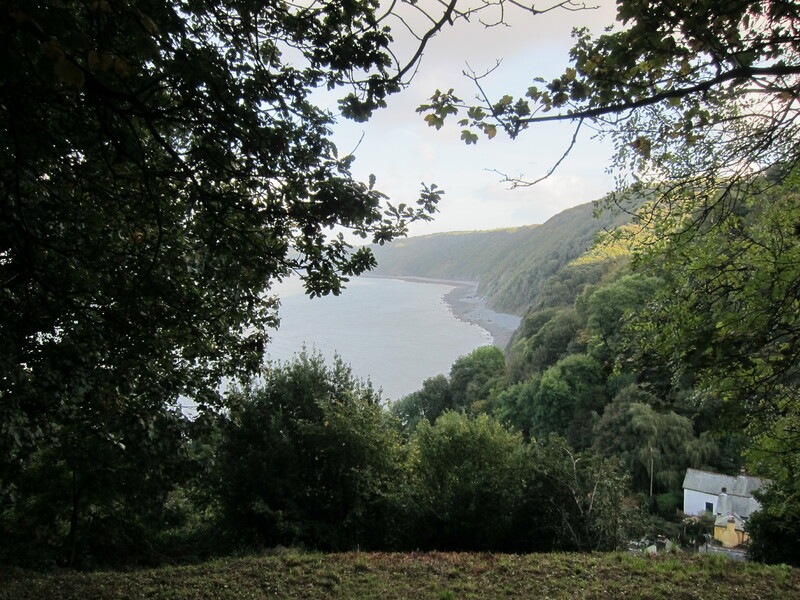 We dropped down a steep wooded valley to Lynmouth, which seemed to take hours as it zig-zagged down the cliff. Handily, there was a waymarker showing the routes to America, New Zealand and Iceland. We arrived at the bottom only to see a funicular arrive at the same time. Had we known, we would have given it a try. Distance of 14.2 miles. We have just had a truly excellent meal in the Ancient Mariner Inn. We left the Gulag at 9 this morning, after I had wasted a load of time trying to contact British Airways about a booking for Australia, and ate in a café on the sea front – The Captain’s Table. The path leads up out of Woolacombe, towards a place called Baggy Point. The view of Lundy was very clear, and we could also see all the way back to Hartland Point. 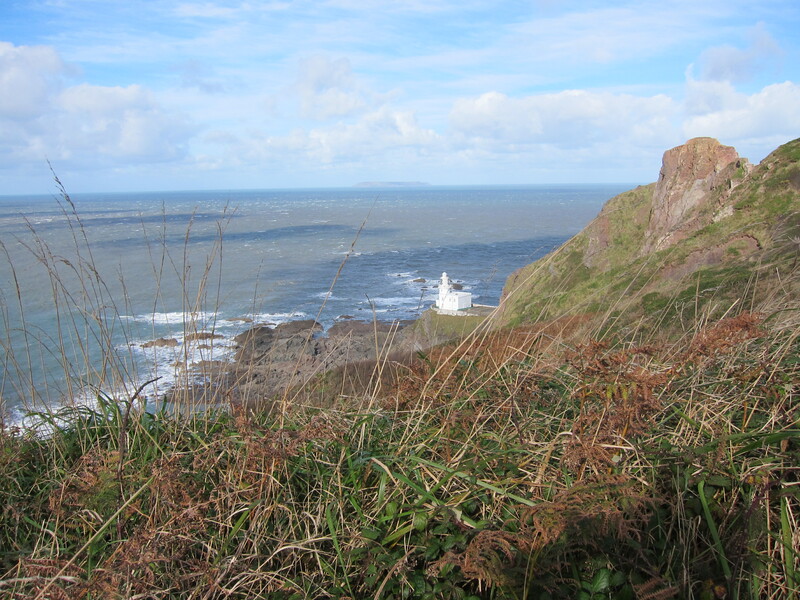 Most exciting of all was the nearness of the South Wales coast – not far now before I shall be in home territory! The Gower peninsula with the Worm’s Head was quite clear. The stretch of coast here is well-known for seal-sightings, and we were thrilled to see a pod of them. Rachel and I have argued about the collective noun for them. I think pod sounds right, she is certain it’s a herd. There were six creatures in this group, three basking on the rocks, looking like slugs with tails and fins, and three bobbing on the waves. In the same area I saw a black headed bird with a white collar and red chest. No idea what it was, but subsequent googling suggests a stonechat. I’ve never seen one before, but was rather taken with it. There were a couple of steep ups and downs, but nothing too serious. We stopped at Lee for lunch at a what should have been a delightful café, but the service was so slow we didn’t have as much as we planned. The pasties were good, though. We came to Ilfracombe in the late afternoon. The main town was dead – we searched long and hard for a decent café, but all were either chains or shut. We went into an old-fashioned Gentlemen’s Outfitters in search of new socks – it was a relic from the 1950s – hats, checked shirts, walking sticks and scarves, all in beautiful wooden drawers and cabinets. The visit was successful and a vivid red pair of socks purchased. A curious insight into the causes of the First World War was offered to us – a poster outlining the story of Alf Price, who, annoyed at the visiting Kaiser’s behaviour in throwing stones at the beach huts, had punched him on the nose. Apparently, Kaiser Bill bore a grudge ever after against the whole British nation. They didn’t tell me that in school! Down at the waterfront, business was more brisk. We found Dolly’s Café and had two scoops each of creamy ice cream, with extra clotted cream. Mmmmm. Whilst we were there, several very odd characters came in – three white people and one black person. All were dressed in long coloured streamers or rags, with feathered hats and all were ‘blacked-up’. No-one else in the café seemed to think their appearance at all odd, and we assumed they were just a bunch of local eccentrics. All was revealed when we emerged to discover that they were part of a v ery large group of Morris dancers, prancing on the green. I have never seen colourful Morris costumes befores before – only the traditional white outfits. The bells on their legs were surprisingly loud. We finished with a long, pleasant, but uneventful walk past the Iron Age Hillsborough Fort, arriving into Combe Martin at around 7pm, having covered 15..9 miles. Today was a good day to end the trip. We left our very nice B & B (excellent breakfast of smoked salmon) and walked back into the town to rejoin the path. We wound through the edge of Westward Ho, into the little village of Appledore, with its lifeboat station and prettily coloured houses. Appledore is an old harbour, used for years for salmon fishing. 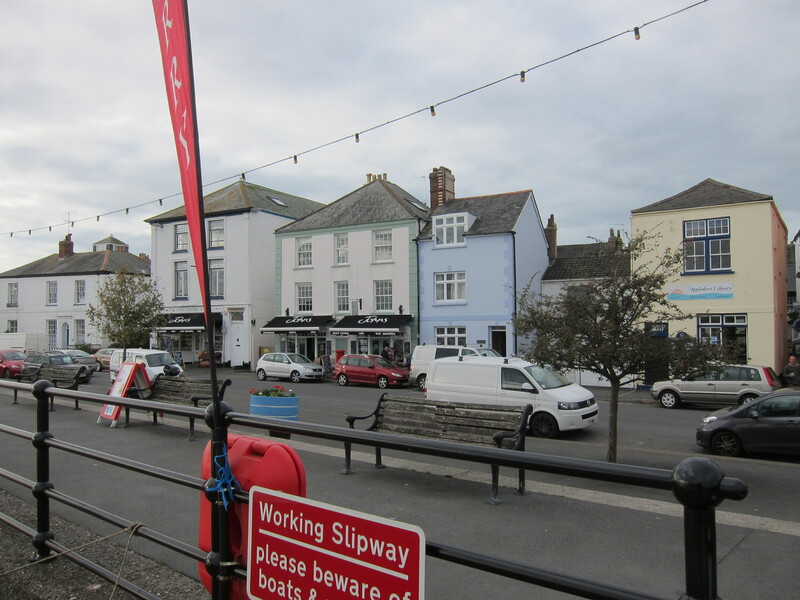 It is the location for the ferry across to Instow. There was a slight hitch when Chris realised he had forgotten his phone. A frantic call to the B & B arranged for Mrs B & B to drive round to meet us on the other side of the ferry with the offending article. We had an excellent coffee in the wholefood café and shop at Instow whilst Chris’s phone was en route. Although it was early for elevenses, the cake looked extremely yummy, so we took the opportunity to load up on calories early. 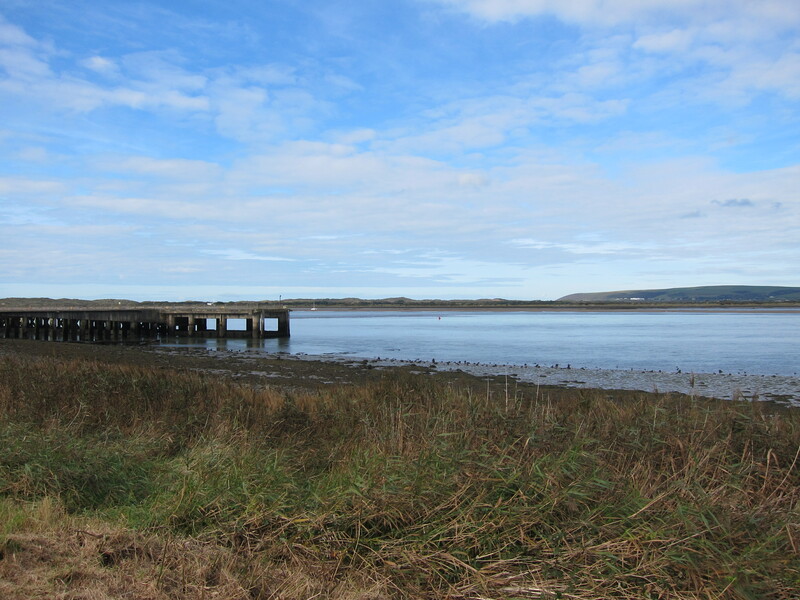 Not that today’s walk was difficult – it took us along the south bank of the River Taw, which meanders gently into Barnstaple, with mudflats, marsh and various bits of old engineering to interest us, particularly the old Instow railway station, on the route between Barnstaple and Fremington. We watched some workers fixing the old railway bridge crossing an inlet. They had their work cut out – every time they tried to push the full barrow up the bank, they slipped and slid in the mud. We marked them for barrow-running technique as we munched our lunch. The older chap had more technique, the younger ones, brute force. 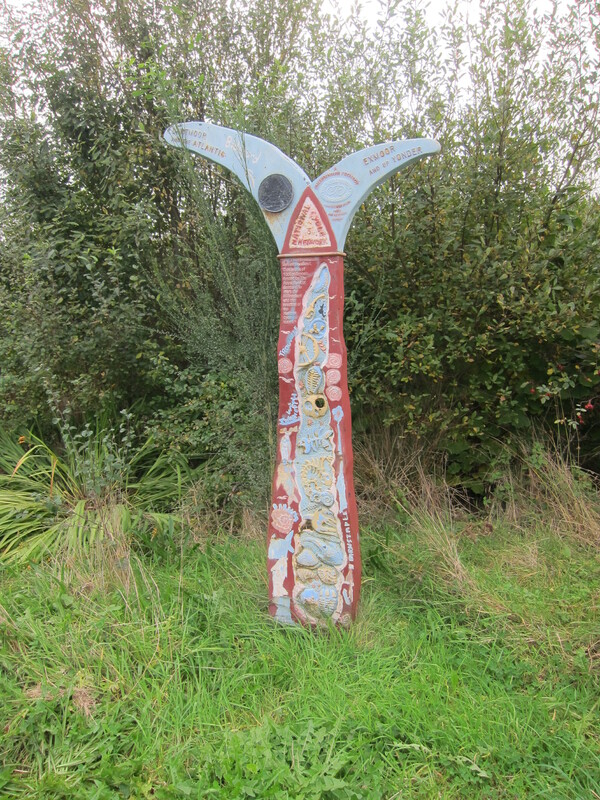 I was delighted to find two of the Sustrans cycle way markers, that I haven’t seen for ages. There were loads in Kent, but they have been few and far between since. Like most flat journeys, the walk seemed to take a longer time than expected. We arrived in Barnstaple at around 4pm. Jon and Chris elected to call it a day, as Jon is now going inland to pursue his end-to-end journey by going across Exmoor and has refused to accept my pleas to divert to the coast as it would mean going west again. 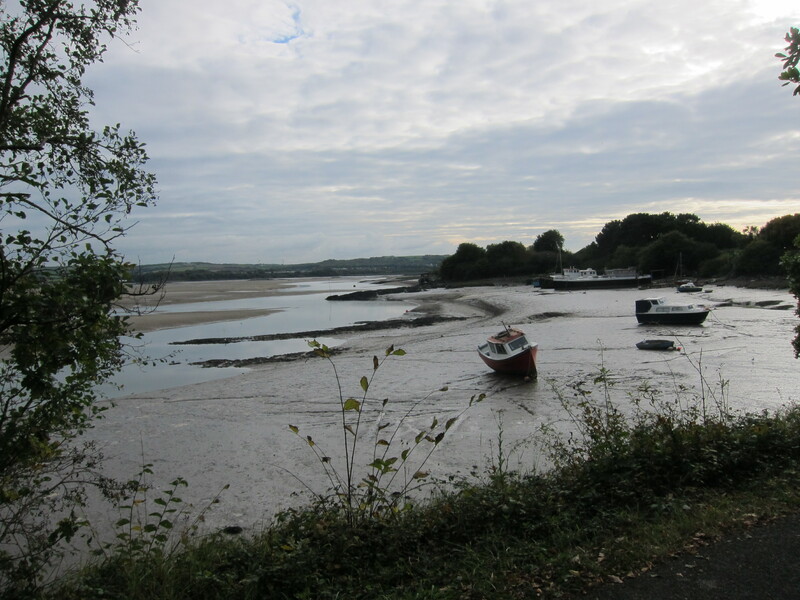 I decided to continue along the north side of the River Taw as far as Braunton. Other than crossing the modern road bridge, which saves a good mile on going into the town to cross the old bridge, It was a very dull walk, mostly paved, and there was a rather creepy bloke on the path who kept stopping, then when I passed him, started again, passed me and stopped. But he didn’t actually say or do anything. I popped up onto the main road just outside Braunton and got a bus back to Barnstaple. We are staying in an enormous old rectory, high up in the attic. Doing the extra to Braunton also gave me five more miles, bringing the day to 22, the longest I have done since the crazy Seaton to Exmouth stretch on Day 28. Today started out very straightforwardly. 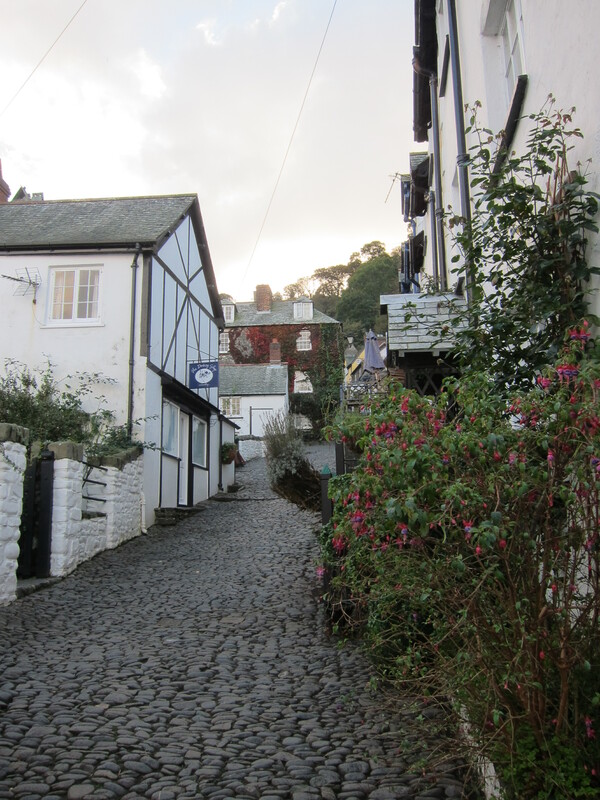 Back up the cobbled street of Upalong-Downalong to the path, greeting more Clovelly cats as we went. The first three miles were along a level path called the Hobby Track through the woods. Once again there were lots of pheasant, but today there were also lots of guns. We could hear the beating and them the calling of the pheasants as they took flight. I shouldn’t complain as I am happy to eat pheasant and it is far better than factory farming, but I struggle to understand how anyone can actually get pleasure out of killing a live creature. The guns gradually faded as we travelled briskly along. Our first descent was to Bucks Mill. – a tiny hamlet which once again hailed to produce a café. Then up and flat again until a sharp descent into Peppercombe where there was a crew of National Trust volunteers burning brush. There was not much wind so the smoke caught my throat and got into our eyes and hair. 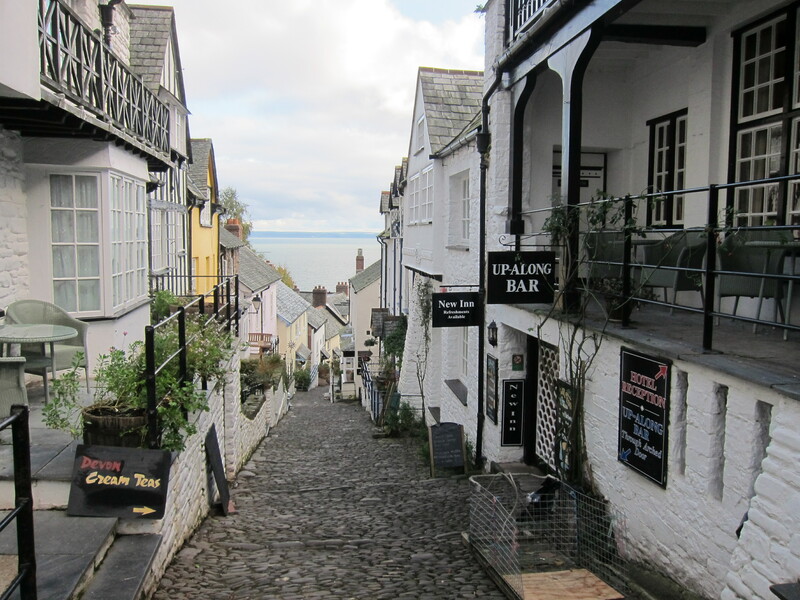 As we looked back, we could see Clovelly – it had a bit of morning sun, but was soon in shadow. Coming out of Peppercombe, the path climbs up to the cliff top and veers north again. There were several long, painful ups and downs, before one drop right down to the cobbly shore. There was lots of litter and driftwood, some of the bakers’ tray sleds that the people of Clovelly use to drag things up and down. Not sure if they find trays that have come ashore or whether the trays get washed away. We reached Westward Ho! along the old Bideford to Westward railway track, which was apparently torn up for the First World War effort and shipped to France. Unfortunately, it never got there, being sunk in the Channel. After an excellent cream tea at the Tea on the Green Café, we arrived at our B & B, the Mayfield. 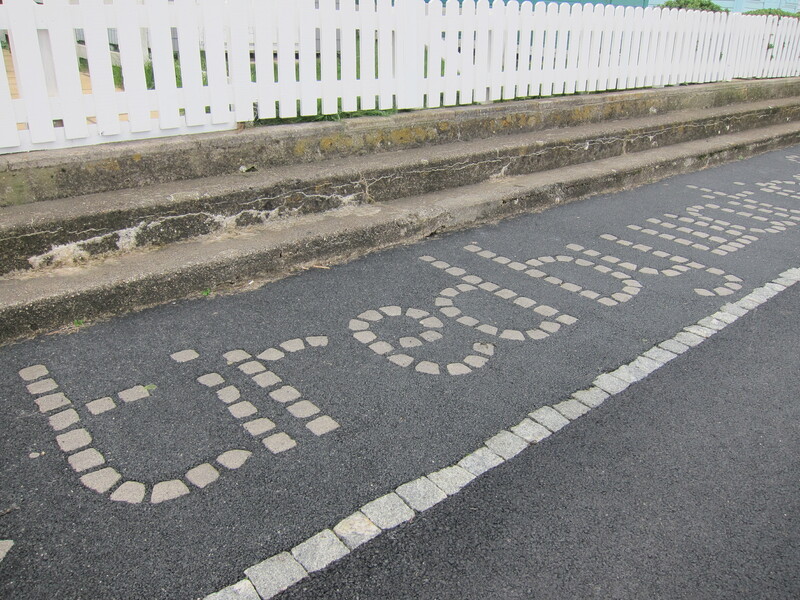 We had noticed down on the sea-front, some of the lines from Rudyard Kipling’s famous poem ‘If’, laid out in shells. It seems he went to school here, in the buildings opposite our B & B and this is where his book ‘Stalky & Co.’ is set. Excellent school stories – not nearly as ‘play up and play the game’ as you might imagine. In fact, Stalky is a rebel who hates games – my kind of schoolboy. Today’s distance was 19.7 km – just under 12.5 miles.